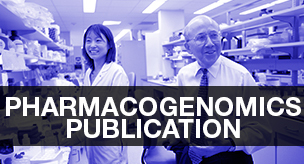 Published in the British Journal of Clinical Pharmacology, a team of researchers from the Mayo Clinic, led by the director of the Center for Individualized Medicine's Pharmacogenomics Program, Richard Weinshilboum, M.D., applied a genome-wide association study (GWAS) to identify genetic factors that contribute to variation in plasma concentrations of Citalopram (CT) or escitalopram (S-CT), and their metabolites in Major Depressive Disorder (MDD) patients treated with CT or S-CT. The GWAS was performed using samples from 435 MDD patients. Linear mixed models were used to account for within-subject correlations of longitudinal measures of plasma drug/metabolite concentrations (4 and 8 weeks after the initiation of drug therapy) and SNPs were modeled as additive allelic effects. The conclusion was that in vitro and in vivo studies have suggested that the biotransformation of CT to monodesmethylcitalopram (DCT) and didesmethylcitalopram (DDCT) are mediated by CYP isozymes. The results of this GWAS performed in MDD patients treated with CT or S-CT have confirmed those observations but also identified novel genomic loci that might play a role in variation in plasma levels of CT or its metabolites during the treatment of MDD patients with these SSRIs. Read the full article published here.